(This is Jerome Kuseh’s sixth review for Kinna Reads; his previous reviews can be found here. Jerome Kuseh blogs about business and finance at ceditalk.com; about politics at jeromekuseh.com; and about ethnicity and identity at ukweliwa.org). Few people can claim to have been involved in the politics of the country as much Dr Obed Yao Asamoah. He has served in some capacity either as a member of, or in opposition to, every regime since the National Liberation Council (NLC) which was set up after the overthrow of Dr Kwame Nkrumah. With such extensive experience, I was happy to hear that he had published a book. That’s something we need more of from our leaders. 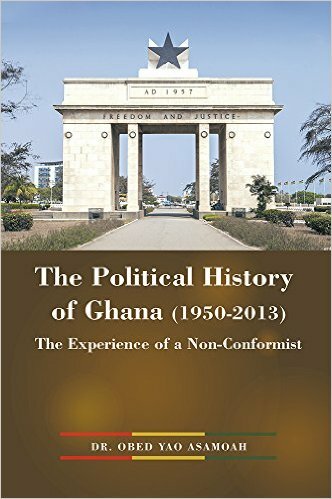 The book’s full title, The Political History of Ghana (1950-2013): The Experience of a Non-Conformist, expresses the purpose of the book. It is a cross between a memoir and a chronicle of the country’s politics complete with an analysis of its perennial problems. The part about not conforming refers to Dr Asamoah’s description of himself as a “freethinker”, that is to say he does not subscribe to any political ideology, only to pragmatic solutions. Perhaps that explains his involvement with parties of different ideologies. Dr Asamoah was born on February 6, 1936 in Likpe Bala, in the Volta Region and that is where the book begins. We are told of his early childhood, his days at Achimota, King’s College in London and then Colombia Law School in New York where he met his wife. His family was active in the Togoland Congress, a party that, along with the opposition parties to the CPP, wanted a federalist system of government. It is unclear however, where Asamoah’s sympathy lay with regards to Nkrumah and the CPP. He appears to justify some policies like the Preventive Detention Act due to the number of assassination attempts that Nkrumah faced, while condemning the declaration of a one-party state, the creation of a personality cult and the silencing of opposition. He viewed some of Nkrumah’s projects as not well thought out, and explains much later in the book that he would have preferred an agricultural and not an industrial programme. Perhaps because of his experience as a foreign affairs minister, he does well in analysing Nkrumah’s foreign policy. He reviews Nkrumah’s efforts towards establishing a united Africa, his efforts in the internal crisis of the Congo, Guinea, South Africa and also Nkrumah’s strained relations with Ola Olympio of Togo. It is interesting to note that Nkrumah was considered a destabilizing force by some African leaders due to his alleged interference in their internal politics. For two major suggestions he relies on hearsay – the involvement of Ghana in the assassination of Ola Olympio and that the true author of Nkrumah’s book Consciencism was Professor W. E. Abraham. As a member of the constituent assembly set up by the NLC, Asamoah opposed the blanket disqualification of people who had served in the CPP from further holding office. He also regrets that Dr Busia did not ally with Gbedemah as he claims they had hitherto agreed. Asamoah also felt Busia had an unfair advantage in the 1969 elections because Busia had been appointed the chairman of the Centre for Civic Education which gave him a head start in publicity and setting up the network for a political party. Asamoah was elected as Member of Parliament for the Biakoye Constituency on the ticket of the National Alliance of Liberals (NAL) in the July 1969 general elections. He was a member of the main opposition in parliament as Busia’s Progress Party (PP) had won 104 out of 140 seats. He is critical of Busia’s government. He condemns the Aliens Compliance Order which he saw mainly as a political move against people who had not voted for the PP. He also condemns the Apollo 568 order which expelled a lot of people from the civil service – something he refers to as a political vendetta against the opposition. He makes a brave admission that he was aware of the coup plot against the Busia government but didn’t inform them because he felt such a government was not worth saving. At that time Asamoah was awaiting judgment on a case of deceiving a public officer of which he was acquitted on February 4, 1972. Asamoah describes the coup of January 13, 1972 led by Colonel Ignatius Kutu Acheampong as a pro-Nkrumah coup. He is not too critical of Acheampong; Asamoah portrays Acheampong as someone with ideas which he could not really carry out. He also does not allege any direct involvement of Acheampong in kalabule, a system in which essential commodities were sold at outrageous prices. He was active in the People’s Movement for Freedom and Justice (PMFJ) which opposed Acheampong’s Union Government proposal. One of the surprising aspects of the book is the dearth of information on the 1979 coup that brought the Armed Forces Revolutionary Council (AFRC) to power under the leadership of Jerry John Rawlings. The December 31, 1981 coup is also not looked at in detail. Asamoah reveals that he was called to serve as part of the Provisional National Defence Council (PNDC) because Rawlings included both Nkrumaists and members of the Danquah-Busia tradition in his government. True to his “freethinking” nature, he was considered a Danquah-Busia loyalist then because he had been the General Secretary of the United National Convention (UNC) of Paa Willie in the 1979 elections won by Dr Hilla Limann’s People’s National Party (PNP,) and he was a leading member of the All People’s Party, an alliance of opposition parties led by Victor Owusu. Asamoah served as Secretary for Foreign Affairs as part of the PNDC, and then as a Minister for Foreign Affairs and later as Attorney General under the NDC. He admits that from 1991 he was absent a lot in office as he secretly went around organizing for the formation of the NDC. His argument that the formation of the NDC was to prevent a return to divisive politics of CPP-UP has proved not to be true as similar divisiveness has characterised NDC-NPP politics. After the NDC lost power in 2000, Dr Obed Asamoah became the chairman of the NDC. He reveals the bitter rivalry he had with Rawlings over leadership in the party and his support for Dr Kwesi Botchwey over Professor John Atta Mills in the 2002 contest for the NDC presidential candidate. Ultimately, citing intimidation, Asamoah left the NDC in 2006 after he lost a second term bid for the chairmanship. He founded the Democratic Freedom Party (DFP), which contested the 2008 elections with Emmanuel Ansah-Antwi as the flag bearer. Interestingly, he is silent on DFP’s support of the NPP in the 2008 run-off election but mentions the return of the DFP to the NDC in 2011. For every regime except the NPP and post-2009 NDC, Asamoah talks about the economic challenges they faced. The shortage of essential commodities such as sugar, milk, flour, sardines, corned beef and textiles appears to have been a problem for all governments since independence and only ended after the Economic Recovery Programme (ERP) that started in 1983. Dr Asamoah does not do enough to explain the programme and the effect it had on living conditions in Ghana. An overall assessment of the programme would have been useful. Although it is understandable that as a foreign minister he focused on foreign affairs. It is quite frustrating that with all the experience that Dr Asamoah has in government, his proposals for the development of the country are not too different from what a lot of Ghanaians have been saying – cutting imports, building industry and improving agriculture. It is frustrating because he attributes our failure to take these steps to the lack of political will. If it is the lack of political will which has kept this country from a high level of development for all these years then it is a huge indictment on all our leaders, past and present. 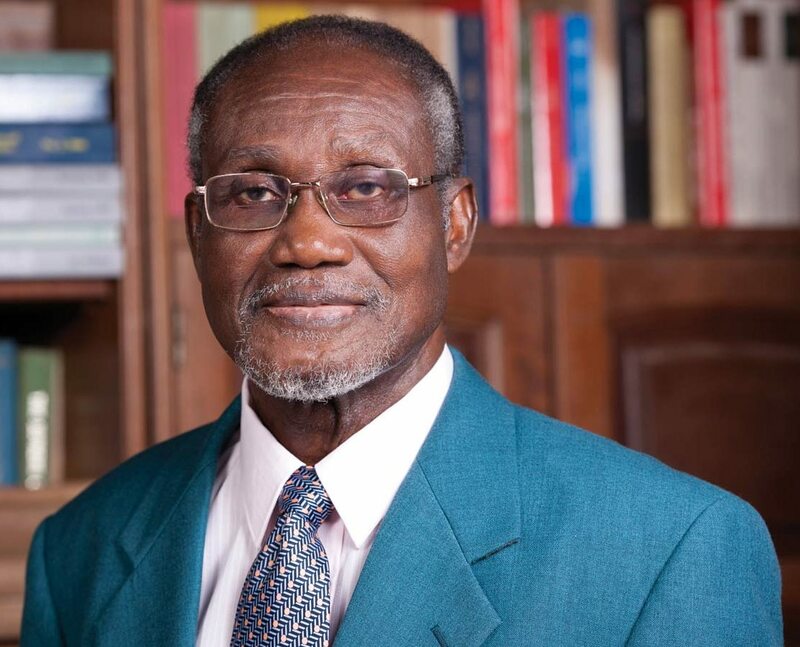 The book is best described as a memoir of Dr Obed Asamoah’s political life. Despite its title, it is not extensive enough to cover Ghana’s political history from 1950 to 2013. To do that it would have to cover more issues and events like chieftaincy and conflict, Jerry Rawlings, the administration of John Agyekum Kufuor and at least the 2008 general election among other things. At 764 pages, the book would have been better served with an index instead of the glossary without page numbers. Referring and looking up specific events and personalities is near impossible without an index. There were also some typographical errors in the book. Despite its shortfalls, the book is very useful as a guide for the evolution of Ghana’s politics. Where it does not fully cover, it opens the door for further enquiry. I must admit that it has introduced me to several events that I was unaware of and that I will seek further information on. It is therefore a book I will recommend to anyone interested in Ghana’s politics.